Welcome to A Pawsitive Dog! 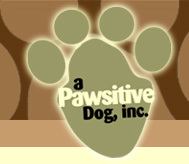 A Pawsitive Dog, Inc is dedicated to improving the lives of dogs and their owners. At A Pawsitive Dog, Inc we solve all problems from housebreaking to dog aggression to barking. Our philosophy is not only to train and rehabilitate dogs but to educate and empower the owner. Owners are provided with various techniques to solve all problems. In addition, owners are provided unlimited access to the trainer during and after the sessions. If you have a ten-week old Labrador, a fully grown Rottweiler, or a Yorkie "Terror" your dog will be trained. AGGRESSIVE DOGS ARE LOVED AND ACCEPTED! Copyright © 2005 A Pawsitive Dog, Inc. All Rights Reserved.